The All Whites have delivered an impressive first up performance under new coach Fritz Schmid, but in the end went down 1-0 to Canada at the Pinatar Arena in Spain. In windy conditions, New Zealand had three good goal scoring opportunities in the first half which they did not covert and the World No 90 made them pay early in the second half. In the 54th minute, experienced Canadian forward Tosaint Ricketts gathered the ball in the area and fired it past Max Crocombe in goal in what proved to be the defining moment of the match. The 30-year-old from Toronto FC scored his 16th goal in his 58th international for Canada. Schmid introduced two new caps in his starting XI with centre-half Adam Mitchell and goalkeeper Crocombe earning their debuts for the national team, while Tim Payne and Cameron Howieson made their long-awaited returns to the All Whites. Experienced defender Michael Boxall was given the captain’s arm-band for the first time. All Whites midfielder Ryan Thomas was not available for selection because of a hamstring injury. The new national coach was forced into an early substitute when Mitchell was unfortunate to hobble off with a hamstring injury inside the first 15 minutes. He was replaced by Dane Ingham. The World No 120 New Zealand, with a gusting wind at their back, started the better of the two sides and could have taken the lead twice within the first eight minutes. Experienced midfielder Michael McGlinchey, playing in his 53 A international for New Zealand, found space on the edge of the area and hit a good strike only to be denied by the right post. Less than a minute later, on the end of a Clayton Lewis corner, McGlinchey again was on hand and this time hit the left upright with Canadian keeper Milan Borjan beaten. 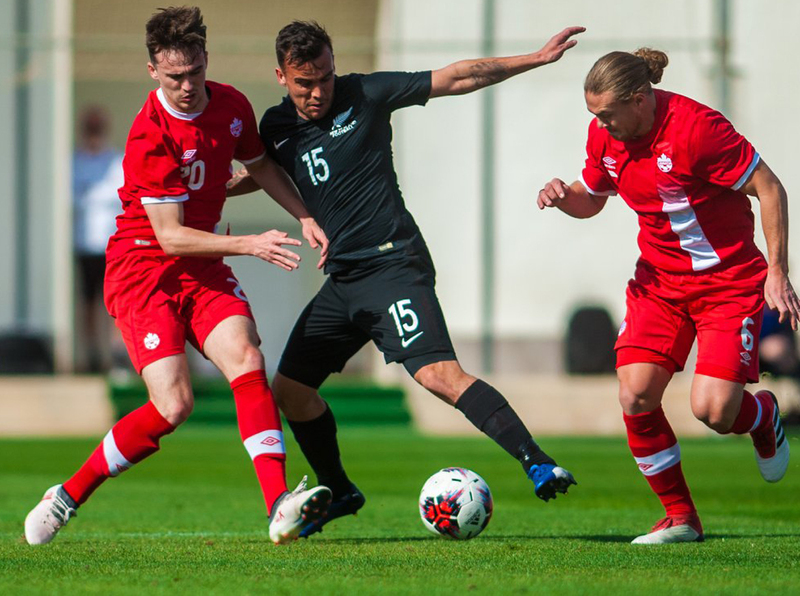 Canada came back into the match and 18-year-old Liam Millar on debut, Jonathan Osorio and Cyle Larin causing some problems for the New Zealand back four but they well were contained. The John Herdman coached side, in his first international in charge, could have taken the lead around the 20 minute mark but were denied by a couple of great close range saves from Crocombe. New Zealand looked to have taken the lead in the 40th minute when midfielder Lewis delivered a good cross for forward Jeremy Brockie who finished well but was ruled to be offside. Payne, in his 15th A international for New Zealand, looked like he had never left with a strong performance in midfield while Rojas caused plenty of problems down the left wing. Canada were the stronger side in the second half and made the most of the wind advantage. They tested Crocombe straight after the break and again the Salford City keeper came up with a fine save. That resilience was broken in the 54th minute when Ricketts showed his experience to take the lead. Schmid turned to the bench in the second half to make the most of this international friendly with six substitutes permitted for both teams. Alex Rufer came on for Marco Rojas, one of the best from New Zealand’s performance, in the 52nd minute and a host of others followed. Young forward Myer Bevan and Andre De Jong (on debut) came on for Jeremy Brockie and McGlinchey respectively in the 60th minute and soon after Sarpreet Singh made his All Whites debut when he came on for Lewis. New Zealand fought hard to chase the game but could not find the final touch going forward to create another clear goal scoring opportunity. With 10 minutes to play Canada’s Tesho Akindele came close to setting up Millar and then almost scored himself inside a minute, and Jonathan Osorio also had a chance to put the game to bed but he was also off target. The All Whites walked off the pitch frustrated with the result, but there were plenty of positives to draw from Schmid’s first international in charge of the national team.